Powder Mills Park- Cross Country Ski Heaven!! Powder Mills Park, located in Monroe County, (Perinton / Pittsford) near Rochester NY is a great park for cross-country skiing, hiking , trout fishing, and generally communing with nature. 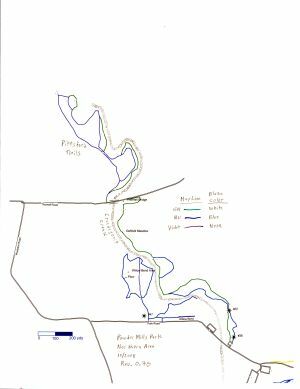 Powder Mills Park has many miles of trails. Most were laid out with xc skiing in mind. The park has a generally hilly terrain, but many trails follow flat or gentle contours for easy hiking or skiing. 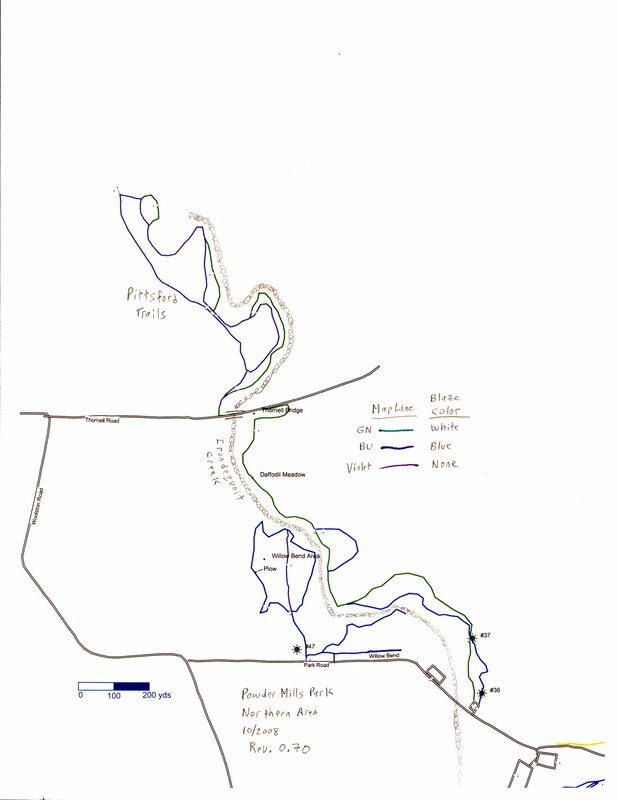 The map shows currently maintained trails. The main trails are marked with trail markers (generally on the right side of the trail) that are 2x2" colored plastic squares. The trails were mapped with a Garmin Map60CSX GPS unit, set to record data every 50 feet (and sometimes every 2-5 secconds, for finer detail). The unit usually reports an accuracy of 25-35 feet. Some trail markers (those in the Northwest section) are a mix of painted blazes and nailed 2x2 squares. This is because these trails were originally created by the Pittsford Trails Coalition (sadly they are no longer around) (thanks guys!) 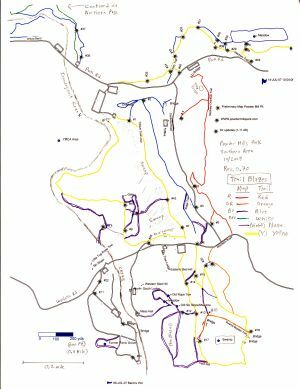 and their system of trail blazes follows the AT method of painted white blazes for the main trail and painted blue blazes for side trails. 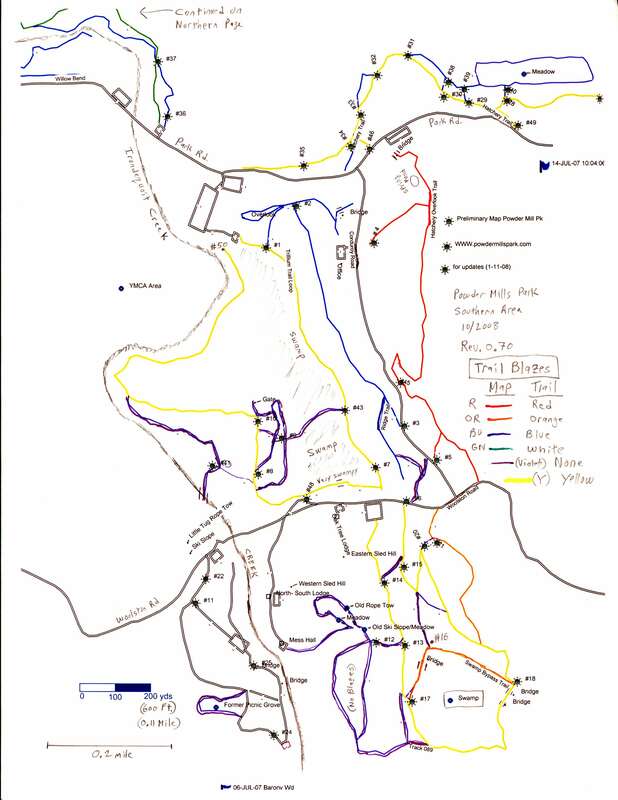 The map shows blue lines for the blued blazed trail, but green lines for the white blazed trail (because the map is on white paper). The Northern section of the park (Dafodil Meadow and Willow Bend are actually in Pittsford, but also within the county park. Outside the park on the North side of Thornell Road is a section of Pittsford Trails. The Crescent trail (a Perinton trail) crosses the park in the NorthEast section. The main trail is marked in yellow, with blue used for side trails. Purple trails on the map are maintained trails, but have not yet been designated by blazing. Many trail intersections are marked on the map with a number. The actual intersection also has a number (usually a small blue and white label, bolted to a tree). Note; signs and trail markers are most often mounted with spacers between the tree and the sign, so that the tree can grow without interference.